Sean Thiessen wondered whether he should further his education or build experience in filmmaking. As an electronic arts major, he got to do both. Like a lot of emerging filmmakers, Sean Thiessen considered whether college was necessary for his career path. “For film, you know a lot of people say you don’t really have to, that your experience is more important,” he said. But Sean took a chance that Missouri State’s electronic arts program would provide this practical experience along with a comprehensive film education. During an early class in screenwriting, he knew he’d made the correct decision. “I had always loved to write, but whenever I would write something, I would feel kind of directionless,” he said. Studying screenwriting strengthened his understanding of visual storytelling and film structure, which brought new intention and strategy to his work. Sean got the opportunity to apply this knowledge by writing and directing his short film, “Posers,” for his senior project, a unique feature of the electronic arts program. The senior project is the culmination of your studies within the electronic arts program. The process begins at the end of your junior year during ART 300: Fundamentals of Collaboration in the Electronic Arts. In this course, you form relationships with your fellow EA students and begin discussing possible projects for your final year in the program. By the end of the course, each student will have pitched an idea to the class, and after deliberation, students begin self-selecting which projects to get behind. 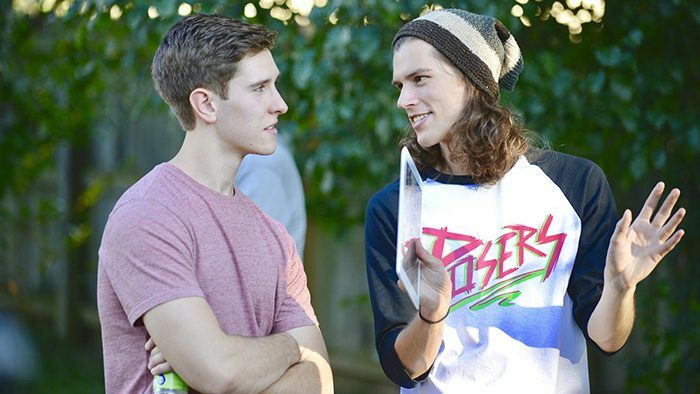 Sean’s short film, “Posers,” was selected, so after finalizing the script in September, his group went into production. If it sounds like a lot of responsibility, it was. But Sean felt supported by the mentorship of EA faculty, who served as consultants to the film. Fellow student Becca Thompson, who has won a number of awards for writing and producing, served as Sean’s producer and assistant director. And thanks to the structure of the EA senior project, the Posers team consisted of students with advanced skills in the specific areas required for making the film, including animator and editor Desmond Dornak, visual effects artist Jacob Dailey, and composer and director of sound Nicklaus Martin. The Posers team has already earned a loyal following on Facebook, and their fundraising video won Second Place in the Promotional Video category of the 2017 Broadcast Education Association Festival of Media Arts. The film premiered in Spring 2017, and Sean is looking forward to entering it in film festivals.